When it comes to the farm-to-table movement and the emerging dining scene in Lexington, one name in particular stands out…Ouita Michel! Ms. Michel is one of the best advocates and celebrators of Kentucky’s southern cuisine and hospitality. Her charming restaurants and sparkling personality provide others a glimpse of what many of us already know – that Kentucky has some great restaurants and dining experiences to offer! After winning the prestigious National Debate Tournament in college, Ouita was on track to graduate and attend law school. But it was her exposure to a wide variety of cuisines around the country while on debate tour that resulted in Ouita finding her true passion. She changed courses from law school to culinary school. Lucky for us! From fine to casual dining, she has elevated the culinary scene in Kentucky with her unique southern-expressive restaurants. Her passion for using farm-fresh ingredients, locally grown products and sustainable seafood is a great collaboration with Kentucky products and great food. 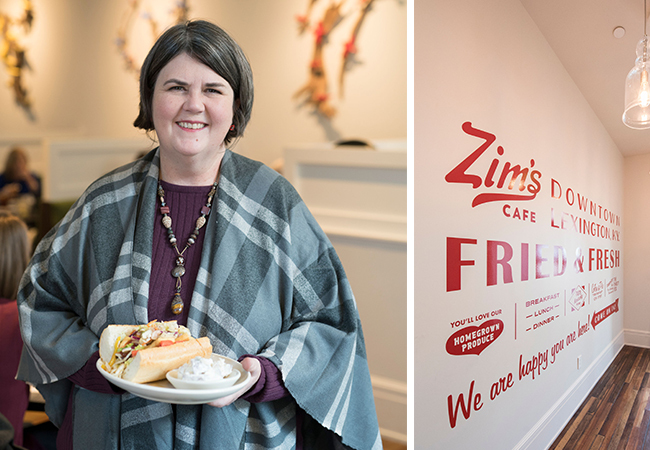 Zim's Cafe is her latest restaurant venture. It's located in the historic Lexington courthouse, which recently underwent a $32 million-dollar renovation. Constructed in 1898, the building provides a spectacular backdrop for Michel’s new restaurant and bar. "I wanted to bring the rural vibe to the urban area," she stated. The restaurant itself, much like the menu, is bright and cheerful. Green walls display different varieties of birds. The decor of the restaurant is in honor of Ouita's mother, Pamela, who had a huge folk-art collection. The "trees" on the wall are carved from Kentucky driftwood and all the birds are hand carved from Kentucky artists. The cardinal on the wall reminds her of her mother. Ouita explained, "We wanted to convey a lighter, brighter sense of everything. People were so stressed out in 2018, I wanted a restaurant that everybody can enjoy. A place that's not expensive." There's a retro feel in the ambiance at Zim’s, and there are fun statements on the walls throughout. 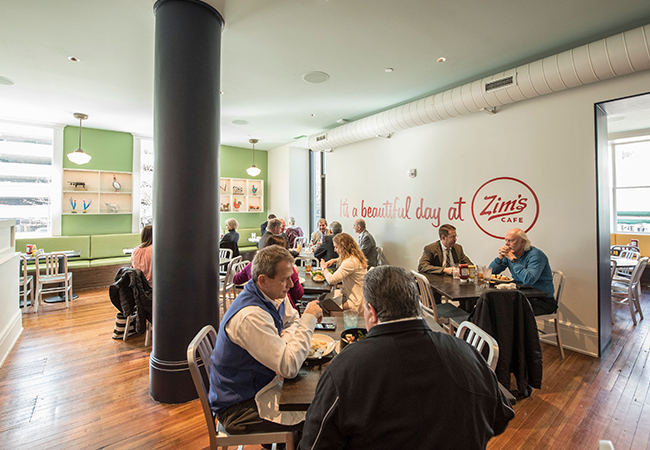 Zim's is open for breakfast, lunch and dinner each day for casual dining. Burgers, sandwiches, and salads are all options. Who wouldn't love to have a burger, made from Kentucky Proud beef, or Ouita's favorite, fried catfish with hushpuppies? There's a daily features menu at dinner that offers comfort food items such as meatloaf, and spaghetti and meatballs. 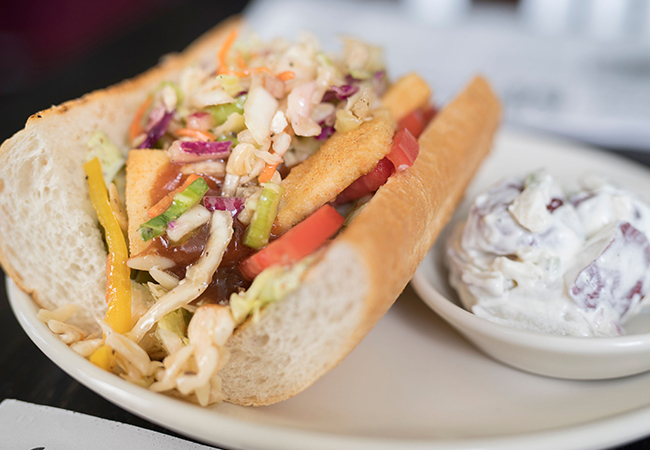 There is something for everyone at Zim's. 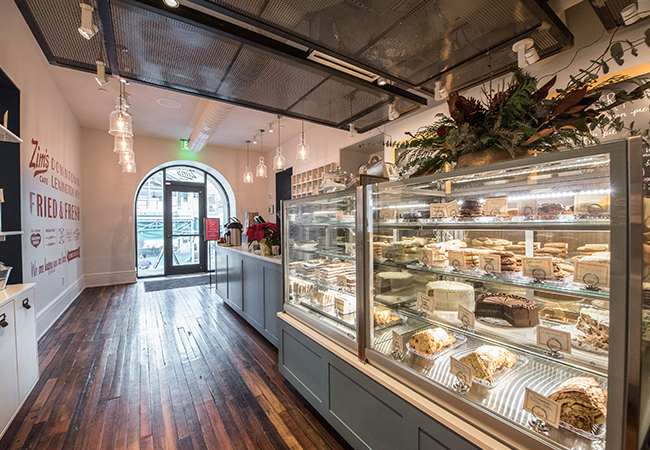 As a promoter and partner of the Kentucky Proud food movement, Zim's Cafe offers a marketplace for Kentucky food products. Whether you are looking for Kentucky Proud food items or something from the Midway Bakery, you can find it here. The Thirsty Fox is located across the hall from Zim's. It's a cool bar with large, beautiful windows looking out onto Main Street. 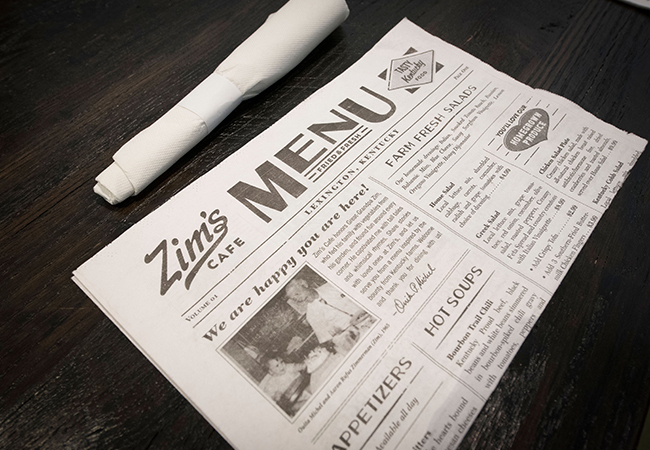 Tables, the full Zim’s menu, and a strong measure of southern hospitality are all found in the bar area. 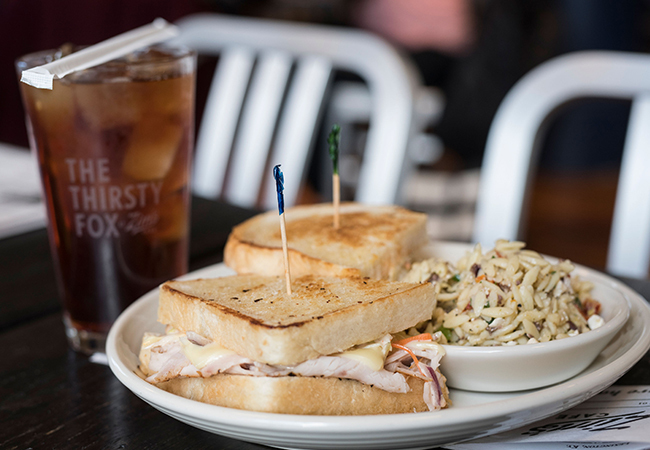 Grab a craft cocktail, a bite to eat, gaze into the hustle and bustle of downtown Lexington, and enjoy Ouita Michel’s latest contribution to Lexington’s dining scene. Favorite ingredients to cook with? Extra virgin olive oil and bourbon, but not together! Favorite city to visit for food? Do you have a favorite food from childhood? Eggplant caviar that my mother used to make. What you say to people who don't like tomatoes? It takes up to 17 times of eating something for a taste to develop, taste changes. You might find you like it. Most famous person you've cooked for? Sarah Ferguson. Duchess of York. What do you want your customers to remember after dining with you? To be happy, welcomed, satisfied and content. I hope they have warm and fuzzy feelings. Best advice for aspiring chefs? Educate yourself throughout your career. Read as much as you can, not just using Google to learn. As you grow you have to be willing to learn new things. And also, never give up! The best kitchen tool for the home chef? Good pairing knife. A well-worn wooden spoon and a well-seasoned cast iron skillet.